By Steve Bell, in today's The Guardian. Pity the can is so full. 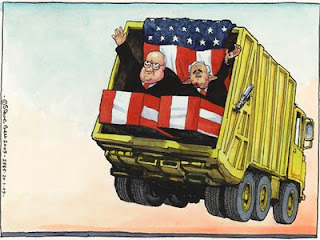 The Guardian cartoon of course rips off another, somewhat wittier, one that ran on the cover of the 16 May 2007 issue of Charlie Hebdo, in which Jacques Chirac waves formally from the back of a departing garbage truck as the newly-elected Sarkozy bids him a gleeful 'adieu'.